Amazon CEO Jeff Bezos and his wife, MacKenzie, are to divorce after a 25-year marriage. The pair announced the move in a joint statement on Wednesday on Twitter. “After a long period of loving exploration and trial separation, we have decided to divorce and continue our shared lives as friends,” the couple said in the statement. Amazon, formed 25 years ago, this week eclipsed Microsoft to become the world’s most valuable listed company. Jeff Bezos, 54, who founded Amazon, is the world’s wealthiest man according to the Bloomberg Billionaire Index, with an estimated wealth of $137bn, some $45bn ahead of Bill Gates. “We feel incredibly lucky to have found each other and deeply grateful for every one of the years we have been married to each other,” the couple’s statement said. “If we had known we would separate after 25 years, we would do it all again. We’ve had such a great life together as a married couple and we also see wonderful futures ahead, as parents, friends, partners in ventures and projects, and as individuals pursuing ventures and adventures. Last year they launched a charity project together, the Day One Fund, with the aim of helping homeless families and building pre-schools in low-income communities. The couple have four children – three sons, and an adopted daughter. 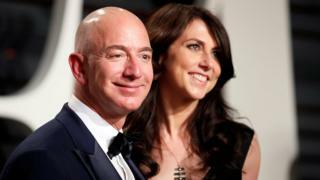 MacKenzie Bezos told Vogue Magazine in 2013 that the pair had met when he interviewed her for a job at a hedge fund in New York. They got engaged after three months of dating and married shortly after, in 1993. One year later he founded Amazon – which began as an online book retailer. The company has since expanded into an e-commerce giant. Amazon was worth $797bn (£634bn) when the US stock market closed on Monday, after rising 3.4% and moving past Microsoft, valued at $789bn.